I have written many posts about my mom since she passed a little over two years ago. Some of those stories have been light-hearted and as joyful as she was and some have been wrapped tightly in the veil of loss. During the past two years, my mother has made it extremely clear that she has been doing her best to keep in touch. While others may dismiss my belief in her presence, I know in my heart it is not fantasy. It is not simply an extension of my overactive imagination. It is not some arc angel named Jingobar trying to earn his wings. It is my mother – I knew her well enough to know how she operates. If I ever had any doubt, even one moment’s hesitation that she was working her magic from another realm, she made it perfectly clear last Wednesday night. Without going into intricate detail, a great deal of my past culminated into a very emotional evening and, where I felt I had failed in the past, I encountered an overwhelming rush of emotion by feeling like I had finally made a difference. After sharing a very touching conversation with a dear friend and wiping the remaining tears from my face, I walked back in to my living room. The early evening sun was still streaming through my window as I sat down on my couch. To my left, my grandfather’s writing desk was cast in half-shadow and half-sun. When I took a moment to absorb the tableau in front of me, the tears returned. 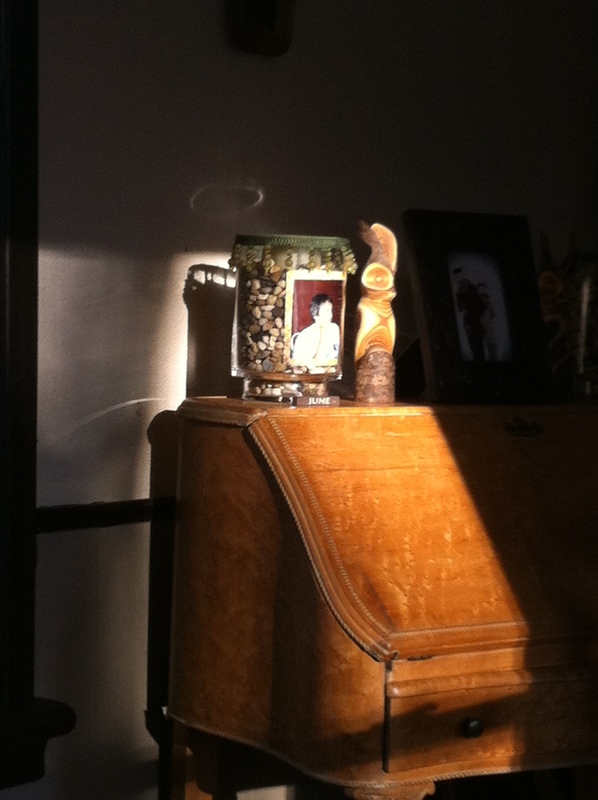 The candle on my desk, the one with my mother’s picture, was one of the few things bathed in the sunlight and that light, perhaps my mother’s light, projected a halo onto the wall behind it. In the two years that her candle has sat innocently atop my desk, this anomaly has never occurred. A brief twenty seconds later the image, and the sunlight, were gone. My mom, June as we came to call after this story (click on the link), sent her message in her way and I got that message loud and clear. There will never be a doubt that she is always with me when the sun shines on June.